You may be looking at a clever novelty item or the future of world currencies. A Swiss refining company is set to introduce to the U.S. market a smartly designed 50-gram gold bar that can be easily broken into 1-gram segments, much like a chocolate bar. At today’s gold price, the complete bar has a value of $2,922 and the 1-gram segments are worth about $58.45 each. Gold has always been the go-to safe haven for investors in times of high inflation, currency devaluation and other economic disturbances. Recently, it’s been on a tear. Worldwide sales of gold bars and gold coins rose to $77 billion in 2011, compared to only $3.5 billion in 2002, according the World Gold Council. Meanwhile, the value of gold has increased about five-fold since 2001. 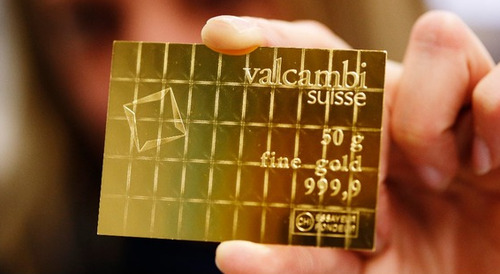 Thanks to the famous Swiss refiner, Valcambi, the average consumer can own the “Combibar,” a portable, easily segmented gold bar that could be gifted to family members or potentially used as currency in times of crisis. The company already has had success in the Swiss, Austrian and German markets, as skittish consumers worry about the future of the Euro. Now the company is looking to expand its reach to the North American, Indian and Japanese markets. In Japan, the company will sell platinum and palladium versions of the Combibar.